HMH Books for Young Readers, 9780152025281, 32pp. Bella Legrossi is the messiest monster in all of Booville. Her slime is the slimiest and her grime is the grimiest. Alas, she is neighbors with Boris Kleanitoff, a persnickety ghoul so tidy he vacuums his vampire bats. What could ever bring these two together? It will take a Halloween party like no other--a full creature-feature of beasts, ghosts, and creepy-crawlies, and some of the fanciest dance moves since Morrie Mummy shook a leg clean off. So grab a mug of ghoul drool and join the fun! 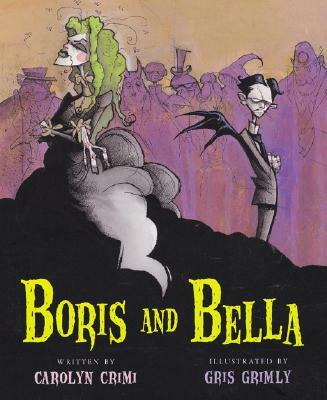 Wicked wit Carolyn Crimi and illustrator Gris Grimly have put their heads together (along with a few they found in the graveyard) and cooked up the funniest, funkiest, and out-and-out freakiest monster mash you've ever seen! CAROLYN CRIMI is the author of four other picture books, including Tessa's Tip-Tapping Toes, illustrated by Marsha Gray Carrington, and Don't Need Friends, illustrated by Lynn Munsinger. She lives in Chicago, Illinois.